Cynthia has it all: brains, beauty, impeccable style, and a gorgeous husband (who happens to be Nora’s ex). When Cynthia eagerly befriends Nora, Annie’s oldest friendship is tested. Now, each woman must wrestle the green-eyed demon of envy and, in the process, confront imperfect, mixed-up family histories they don’t want to repeat. 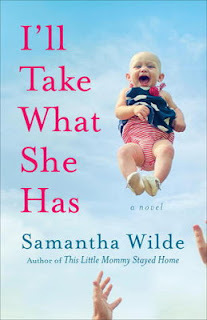 I loved Samantha Wilde’s first novel This Little Mommy Stayed Home so I was eager to get stuck into her new novel and I wasn’t disappointed. I’ll Take What She Has felt original, fresh and honest in both the characters and the plot so I was completely hooked. Wilde’s last novel made me feel less alone in the chaotic state of being a new mother while this one gave me Annie- who is determined that being at home, raising her two girls, is absolutely the right thing for her to do. Being in the same place myself, I related to the feeling of her purpose, but what made Annie’s devotion tricky was her strong feminist upbringing which seemed to be at odds with her desire to be the one to raise her girls full-time. Her struggle began to show up as obvious prickliness towards her best friend Nora (who was fixated on getting pregnant) whom Annie just couldn’t understand or empathise with. There was no denying Annie erratic behaviour was unsupportive of her friend and I appreciated that Wilde did nothing to smooth things over but let their moving apart go as naturally as one would expect. Nora immediately latching on to a new best friend caused further tension and left Annie struggling with her confusion, forcing her to examine her own upbringing more closely. Apart from the education about friendship and self-exploration, I loved both the husbands and the school Dixbie in this novel. I wished there had been more interaction perhaps with the students and life within the school, I know that Annie was a house mother in the dorm but only one student was ever mentioned and it felt a bit unnecessary to have her be a house mother when it didn’t play much into her life. It’s very hard to see another person’s perspective sometimes so Wilde has written it out for us and we would all do well to read I’ll Take What She Has and save our own female friendships from prickliness and lack of understanding! Thank you to Samanttha Wilde for our review copy. All opinions are our own.